Ghazaal Beledi (Arabic for "Dancing Gazelle") is a world fusion and tribal belly dance troupe based in Phoenix and Tempe, Arizona. 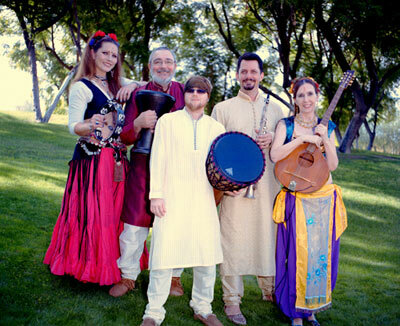 They formed in 2008 to perform at the 2009 Arizona Renaissance Festival in a world music and dance variety show and found that they didn't want to stop there! Since then, they have performed every spring as Arizona Renaissance Festival belly dancers, and they have continued to create and perform together throughout the year for everything from pubs and nightclubs to festivals and street fairs. The music is inspired by both modern and traditional cultural pieces as this plays a very significant role in the choreography and improvisation of the dance pieces. The dancers are trained in a number of styles including Irish, English, Scottish, West African, Bhangra, Rajasthani, Bollywood, Arabic, Cabaret, Egyptian, Tribal, Flamenco, Ballet, Modern, Jazz, Hip Hop, and Breakdance, as well as prop and fire art. They draw from all of these influences in their world fusion style as well as adding in some theatrics and humor for good measure. Ghazaal Beledi is involved in many grass roots artist organizations such as RAW Artists Network Phoenix, RAW Artists Network Tucson, and REIGN Artists Network Arizona. We are dedicated to participating with local underground artists and together expressing our talents to the community and nationwide. You can see us supporting these local venues as well: 910 Live, Club Red, Hollywood Alley, Martini Ranch, Mijana Grill, The Sail Inn, Club Palazzo, The Foundry, and Crescent Ballroom. Ghazaal Beledi World Music & Dance would love to perform at your event, festival, club or party. Please contact us for booking information!